If there’s no wreath on your door how will Santa know how to swing by? While we love a classic wreath, with its beautiful greens, we thought we’d use this slightly chilly weather we’ve been having as inspiration for this decoration. You could also make a series of snowflakes and use the loop to hang them on a string, creating some beautiful winter bunting! 1 Cut out the centre of the paper plate. The easiest way to do this is to fold the plate in half and cut out a semicircle about 8cm in from the edge. 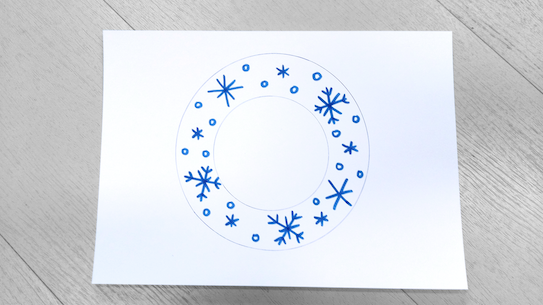 If you’re using card, draw one circle inside the other, and cut them out. Add some winter-inspired patterns. 2 Cut paper into thin strips. 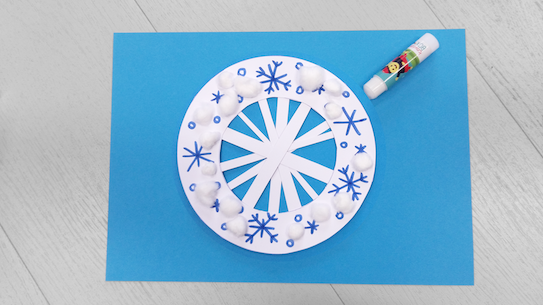 Layer strips at different angles over the centre of the wreath to make a snowflake shape. You might want to experiment before you glue the paper down to see what patterns you can make. 3 When you’re happy, glue your paper strips in place. 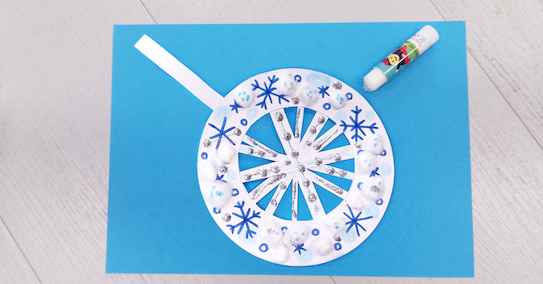 4 Flip the wreath back over and glue cotton wool snowballs onto the wreath shape. Add some snowflake patterns. Set to one side to dry. 5 Add any decorations you have to hand. Blue and silver colours work great, and anything that glitters! 6 Using a leftover strip of paper, glue a paper loop to the top of the wreath so you can hang it up!